To watch Amarula- a tragic, love comedy performance which brings to the front themes ranging from explicit family values, ‘cross-generational’ love affairs, intimacy in return for good university grades and fear- is to be titillated, to be shocked and to be tickled to laughter, all at the same instance. The narrative is set in two coastal households and a university hospital, with the last near-suicide scene taking place in a cliff outside of this trio setting. The play is wrapped in a strong coastal identity evident in the choice of dressing (Kikoi, leso and dhera) and idioms like ninino (loosely translated as ‘whatever’, used in instances where one cannot seem to place a finger on an exact word), bibiye (a term a husband would use to refer to or summon his wife) among others. While all along the performance we are introduced to the two families, each existing in their own prevalent conditions, with a brief occurrence in the university, the last scene offers us a chance to see all the characters come together, part as props as the narrative jolts us into and from flashback, and part as a witty way to have all the performers on stage for an organized ending which doesn’t necessitate them to run from backstage to an applauding audience. 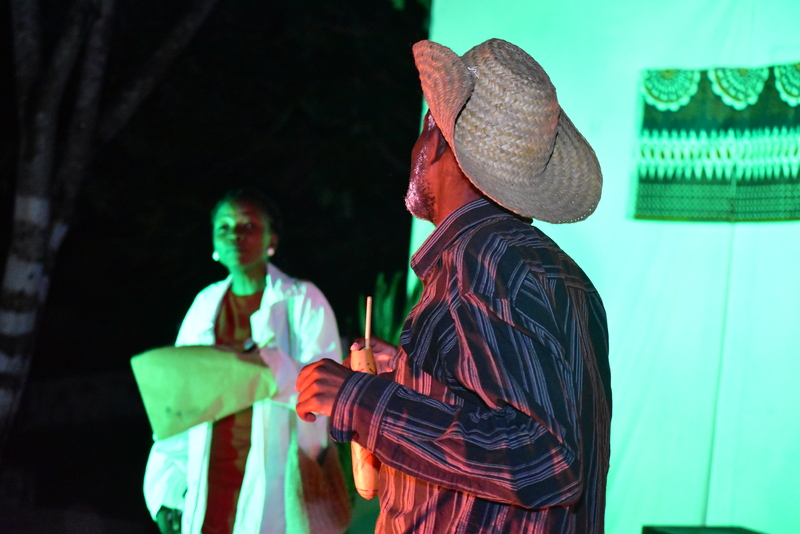 Amarula, (Watch it here) staged at the SwahiliPot Hub Amphitheatre, revolves around the story of Dr. Ama, a blind girl in love with her medical counterpart, Dr. Rula and the title makes sense once the audience interacts with the protagonists encapsulated into one element by their love. It largely happens in the fictive present where the audience is introduced to Ama’s challenged family- a crippled mother, a blind daughter and clown-like father who is a habitual drunkard- without necessarily taking us back to how it all happened. From here, we are introduced to Rula’s family and his father’s worry that his son, who hasn’t shown any inkling of getting married, might be impotent or even to a larger extent queer (based on the terms the father uses to describe his son). By introducing these two families, several themes are postulated. There is the stark difference in literacy, the parents being largely illiterate while their children are very well educated. While Dr. Rula seamlessly merges two languages, the patriarchs show a tendency to corrupt and bend English words to their own understanding. Sexuality is also addressed, with Dr. Rula’s father wishing for grandchildren and he, at some point, even wishes to hear a rumor that his son has at least fathered a child outside. The idea that his son has shown no interest in a woman is problematic for him, leading him to doubt his sexuality while jabbing at his less masculine behavior as a lobbying point. A case in point here is how patriarchs set out to blame their sons’ shortcomings on on their mothers. A son in an African homestead setting who shows less masculine qualities is said to have inherited from his mother. Amarula also brings out a recurring aspect in many households, that there are some secrets that only women know, most especially the paternity of the child. This is portrayed when Dr. Rita introduces herself to Dr. Rula’s family as his fiancé, and Rula’s mother is explicit that Rita should address the man, not as Rula’s father (or Rula senior as he introduces himself) but strictly as her husband. Again, this explicitness may come from her insecurity since she cites her husband as a man who is after the younger lady tenants at their residence. Ama’s father is portrayed as a heartless but witty clown. The first scene opens with Ama’s mother crawling on the floor because her husband has snatched away her walking stick. He casts himself as the victim in the family for having a crippled wife and a blind daughter- further noting that even those who visit them are disabled (in reference to Ama’s dumb friend) and this brings to the front the struggles that disabled people are coupled with. While in real social settings the feelings may be well obscured in kindly gestures, Ama’s father is brought out as the voice that represents the undertones in society regarding disabled people, an edge he clearly blunts through his witty remarks which would otherwise be rather offensive in a normal setting. Throughout the play, Ama plays the disgruntled character and the only happy moment in her stage life is through the flashback which takes us back to her life before becoming blind. She uses a stream of consciousness to draw the audience in on her plight through her emotional soliloquy which is astoundingly effective. I tried to translate the stage as an extension of the performance, an element which should complement or further enhance a theme in the play. The props and plot should bear some sort of interrelatedness. One wall had a framed fabric while the other one had a huge painting of a butterfly which had been (until the wind almost knocked one of the props down) partly concealed by a portrait which was also brought down by the wind. Naturally, I’d have expected one of the performers to pick it up and improvise a line that would make the audience believe that it wasn’t by accident that the portrait fell. Still, it was evident that the performers didn’t utilize of the props as the entire play was performed while standing, yet we had seats as part of the props. The fabric has a lot of significance as a tool to preserve culture and it has a significant place in most African communities. Its purpose transcends the mere intention of covering our nakedness, going even to some extent as a representation of class as seen in typical attire from Western Africa. The Swahili leso has been a credible representative and preserver of Swahili culture and has also become a tool of conversation in a conservative but very poetic culture. I feel having a hang leso with a message that is congruent to one or several themes in Amarula would have gone a long way in the aforementioned interrelatedness. The only prop which was used very effectively was the bookstand in the middle of the stage. It brought out a distinction between the homestead and the university hospital, and Dr. Rula actually picks a book from it. I think it’s an aspect that has been missing from African performances, both theatre and film and to a large extent it may be a portrayal of our unwillingness as Africans to fully embrace a reading culture. The stage setting has been used in numerous instances to psychologically influence the audience and the very presence of books and bookstands in Western productions not only goes a long way in promoting a reading culture but also presents some sort of meeting point for affective film/drama performances and the literary world and its intellectual intentions. I am not certain whether the poor stage lighting was intentional or accidental. I recall seeing someone prod the overhead light with a long stick, attempting to tilt it downwards so it could light the stage better. Either way, darkness and light have been used in stage performances before to portray different aspects, the former representing concealed truth while the latter (as in the case of ‘Cave analogy’ in Plato’s Republic [light with shadows]) as a representation of the different degrees of knowledge. In Amarula’s case, could the partial darkness be a representative of hidden truths in the mercury-copper ridden sugar scandal that Ama’s father mentions, and could the light at the center of the stage reflect the knowledge represented in the books and the white carpet (ray of light?) leading from the book stand to the front of the stage be an emphasis of the same? While the book stand as a prop added a lot of marks, it was Ama’s contemplation of suicide at the end that reflects how human attitudes in a social context play a part in accelerating mental health issues to a point the victim feels they can no longer thrive in that society. We come to the revelation that Ama’s blindness was as a result of a bomb blast (whose place we are not told), thus her disgruntled disposition comes from a place of trauma which is further aggravated by her clown father who spits malediction at her. The collective manner in which all the performers plead with Ama not to commit suicide, hence becomes an active call to address mental health issues from the societal standpoint. Still, I find the bomb blast premise a little too inconvenient. It doesn’t play into the general atmosphere of the performance, considering that her father was very impersonal about her condition. Being a victim of such a catastrophe ought to have drawn sympathy from her father, as another script writer observed while we were discussing the play afterwards. Based on her father’s reaction, it would have been more convenient to have a different premise, something that would have logically made her father to be that stoic. Amarula is a play I’d most definitely love to watch again. With this kind of productions, the coastal film and theatre scene is set for a huge transformation. Many thanks to Shufaa Yakut for her insights regarding finer details of the play. Writing the East African Coast.